Nothing happened over the past two days that will change what happens with Georgia's bowl opportunities. There is some chatter that the Outback is worried about how we'll travel. The bowls no longer decide who comes, though. It is done by the league offices, with input from the bowls. Related: the Gator Bowl appears to be out because we played there last year, which is apparently another feature/bug of the new 'pool' bowl scheme. Remember, those pool bowls are no longer 'ranked,' they are considered co-equal. Meaning 9-3 (6-2 in conference) UGA is in a pool with all those 4-4 teams, and the conference has the ability, based on match up and concerns of bowl partners to slot some teams up or down, including to the BBVA/Independece slots. So, how much do 'concerns of the bowl partners' matter? We'll see. If Mississippi State and Ole Miss get access bowls, Missouri and Georgia are the only two teams that can be slotted into the Citrus Bowl. So at this point, we are hoping for the Citrus, or dreading Music City or Belk (for the record, I'd much prefer Belk). That is if the Outback being concerned about Georgia traveling thing is real. One last note about playing Notre Dame. The ACC's 'pool' bowls get to draw to see who can select the Irish, so some of the hold up is probably waiting to see what teams to put with the Irish (read: won't travel as well, because the Irish will). Based on the number of ACC vs. SEC match ups in bowls, it is possible we get the Irish, but just as possible as any other pool team does. 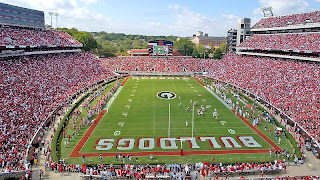 For my money, I think we end up in the Belk, because the conference hasn't done Georgia favors in slotting bowls, ever. We could still end up in the Citrus against Louisville, considering our win over Missouri. Think Bobo would enjoy running wheel routes every play against Grantham?